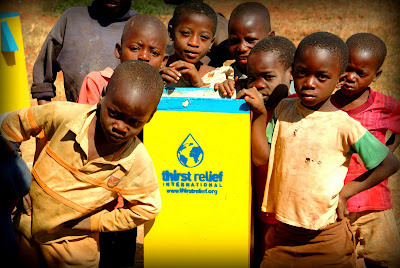 We are pleased to donate our time once again for the Thirst Relief Auction! This year, Enna will be available for a 1.5 hour mentoring session at the WPPI convention in Las Vegas. Alternatively your mentoring session can take place via phone and email, or in Boston any time this spring or summer. Included in the session are a complete set of Grazier Photography's promotional materials, outline of our pricing analysis methods, and a copy of at least one of Enna's favorite business-related books. Goal-setting, pricing, long-term business planning, marketing & branding, personal values, and artistic vision are all topics that we find especially exciting to discuss, and the mentoring session will be tailored to address the topics that you wish to explore. If you are the winning bidder, we will send you a pre-mentoring session worksheet, so that we can prepare for your session and better address your needs. Thirst Relief International collaborates with grassroots organizations and programs to provide safe, clean drinking water to those in need around the world. BONUS: If you're NOT a wedding photographer but still want to participate, we encourage you to make a donation directly to Thirst Relief. Clean water is a necessary commodity for everyone on this planet, and each dollar has a great and tangible impact. Click here to start bidding on a mentoring session!